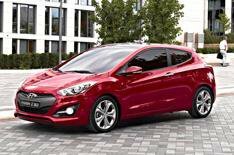 2012 Hyundai i30 3dr unveiled | What Car? The Hyundai i30 3dr has been unveiled ahead of its public debut at the 2012 Paris motor show. It goes on sale in late 2012, and while Hyundai hasn't confirmed prices yet, we'd expect it to cost around 300 less than the equivalent i30 5dr model. Although it shares many of its exterior panels with the five-door model, the i30 3dr has different bumpers, grilles and foglamps designed to give a sportier look. There's also a more tapered side window line and bespoke alloy wheels. The i30 3dr is closely related to the new Kia Proceed, which will also be at the Paris show. Although it's not as overtly sporty as the Proceed, the i30 3dr will compete with a similar range of cars, including the Vauxhall Astra GTC and Volkswagen Scirocco. Kia has confirmed there'll be a hot hatch version of the Proceed, but a high-performance version of the i30 3dr is less likely, to avoid competing against Hyundai's own Veloster Turbo.